The Rx battery of my Raptor was again difficult to charge. Apparently the noise on the voltage causes the charger to abort early. I increased the deltaV detection threshold from 10mV/cell to 15mV/cell. This allowed the battery to charge normally from a full discharge. 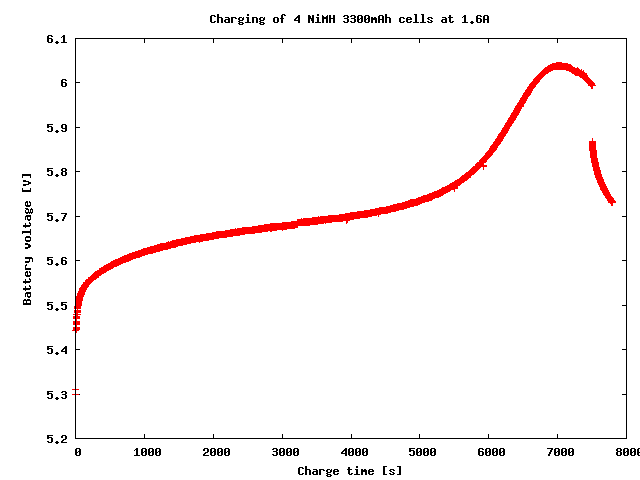 The graph below shows the battery voltage during the charge (not the voltage on the charger, which is higher and noisier). This entry was posted by Niobos on 2009-04-23 at 19:33 under RCheli. Tagged adjustment, logbook, miniTitan, raptor. You can skip to the end and leave a response. Pinging is currently not allowed. Follow any responses to this entry through the RSS 2.0 feed.